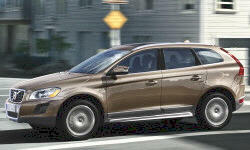 Volvo XC60 Pros and Cons | Page 1 of 1 | Why Not This Car? What drives people to buy (or not buy) a certain car? TrueDelta's members share Volvo XC60 pros and cons based on their real-world driving experiences. Seat comfort and room. Front and rear seats very comfy, front leg room excellent, rear is limited. amazed at comfort and performance. Premier plus model, awesome radio, a/c ver efficient. Change oil every 7500 kms. Very fuel efficient. Transmission is flawless, and shifts imperceptibly. Picked it over MB, BMW Audi. Not sorry.